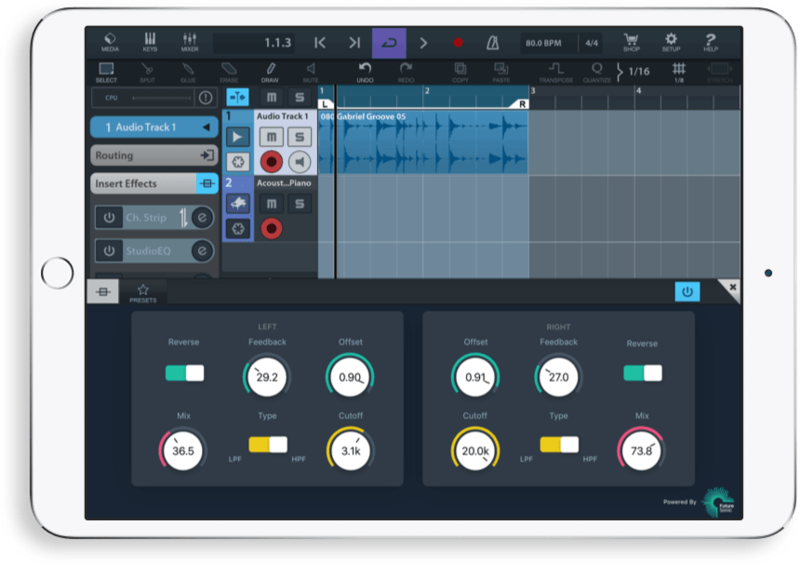 If you’re only just to dipping your toes into the waters of mobile music production then the terms Audiobus, Inter-App Audio and AUv3 might have you scratching your head. What exactly are they and why do they matter for iOS musicians? Well, you’re in the right place! Essentially, these are all just different methods of connecting up your audio apps which makes it possible for musicians to use third party effects and instrument apps inside mobile DAWs such as Cubasis and Garageband. Released in 2012, Audiobus was revolutionary for iOS musicians. The app offered a way for musicians to use their music making apps in conjunction with each other. Audiobus does this by allowing apps send audio to one another. For example, a user could send the audio from an instrument app through a seperate effects app and then record the output within a DAW. This simply wasn’t possible before . The current version is Audiobus 3 which allows for MIDI routing and support for AU apps in addition to the standard audio routing. Prior to iOS 7, Audiobus was the only way for users to take the audio output of one app and and receive it in another. However, this changed with the arrival of Inter-App Audio (IAA) – Apple’s own solution to getting audio apps to interact with each other. The advantage of IAA over Audiobus was the fact that it was already built in. IAA users didn’t need to pay for and download a separate app. All IAA compatible apps are split into two categories: host apps and node apps. Host apps receive the audio from node apps (a DAW for example). Node apps, on there other hand, are the instruments or effects providing the audio. The term ‘Audio Unit’ will likely be familiar to any producer used to working on Mac. In fact Logic Pro is only able to use Audio Unit plugins. Like VST and AAX, Audio Unit is just another plugin format, albeit one created by Apple to be used only on Mac. You may also see Audio Units referred to as Audio Unit Extensions or AUv3. Initially, Audio Units were only available for Mac. But in 2015 Apple introduced Audio Unit support with iOS 9. This made it possible for iPad and iPhone apps to host third party AUv3 apps. The result of this is that mobile producers no longer have to rely on work-around solutions like Audiobus and IAA. Instead they can simply run AUv3 apps within their DAW just like they would on desktop. For example, our own FS Reverser Delay, FS FreezeVerb and FS Refraktor Audio Unit apps can all be used inside any iOS AU host. So there you have it, Audiobus, IAA and Audio Units are simply different ways of getting audio apps to interact with each other, pretty essential if you’re wanting to do any kind of music production on iOS.